While the documents provide little information about the meeting itself, or how it came to be, they do contain several important revelations. As you may recall, more than a year ago, the ACLJ issued requests for public records to both the Department of Justice (DOJ) and the FBI, under the federal Freedom of Information Act (FOIA), seeking documents concerning the June 27, 2016 tarmac meeting in Phoenix, Arizona, between former President Bill Clinton and then-Attorney General Loretta Lynch. The Obama DOJ failed to comply with FOIA, so we took them to federal court. The then-Comey-led FBI responded to our FOIA request and indicated that it had "[n]o records responsive to your request." First, an email under the subject line "Bill Clinton meeting? ", dated June 28, 2016 (just minutes after the DOJ spin team began taking action to respond to the media firestorm surrounding the Clinton-Lynch meeting), senior DOJ officials first informed the FBI of the DOJ's attempts to "deal with this" situation. To be more precise, the AG's office was communicating directly with FBI officials about the matter 8 minutes after DOJ received the first media inquiry about the clandestine meeting. This means that just like the FBI lied, the DOJ also withheld key documents about this meeting from us in clear violation of FOIA. This begs the obvious questions: was the DOJ intentionally hiding this information and, if so, why? Today, we are back in federal court in our lawsuit against the DOJ to demand DOJ's full compliance with FOIA and produce ALL documents. 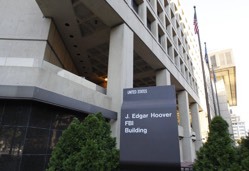 Second, the FBI documents also reveal that then-FBI Director Comey was aware of and circulated to his senior staff (including FBI Chief of Staff and Senior Counselor to the Director Jim Rybicki, FBI Deputy Director Andrew McCabe, FBI Assistant Director of the Office of Public Affairs Michael Kortan, and FBI Associate Deputy Director David Bowdich) a news article regarding the Clinton-Lynch meeting under the cryptic subject line "FYI only." The email, dated June 29, 2016 (two days after the meeting), contained no commentary—only a link to a Fox News article. Another email reveals that about 30 minutes later, Kortan sent Comey (and the other senior FBI officials on the first email chain) an email, under the subject line "From DOJ....," forwarding the email DOJ sent the FBI to "FLAG" the story. That email chain provided the FBI early on with the (still redacted) talking points the Obama DOJ was using to spin this story in the media. This means that the DOJ's spin on this went directly to Director Comey. In fact, it got to Director Comey within 3 minutes of DOJ official Melanie Newman first sending the talking points to the FBI. This story was a big deal. Then, shortly after 6:00 a.m. on July 1st, FBI Deputy Director Andrew McCabe sent an email to Director Comey (along with his Chief of Staff Rybicki and Bowdich) which contained a New York Times article under the subject line "Lynch to Remove Herself From Decision Over Clinton Emails, Official Says-NYTimes.com." That email was marked "Importance: High." Later that day, Comey was also sent a transcript of AG Lynch's interview where she attempted to explain away the meeting. This was the day BEFORE the FBI interviewed Hillary Clinton as part of the criminal investigation into her mishandling of classified emails. Other documents in the production address press inquiries about additional details concerning the meeting, including whether FBI agents present on the tarmac during the meeting instructed onlookers that they were not permitted to take photographs at the scene. One such email includes an FBI employee expressing his "[d]oubt that [the FBI] would say anything" (presumably publicly) if those instructions had been given but noting that it would simply be "good to know." In short, rather than providing answers, let alone sufficient ones, these documents continue to raise serious questions about the details of the Clinton-Lynch tarmac meeting and the extent to which both the Department of Justice and the FBI bureaucracies have gone to bury the facts. Like the DOJ documents, which we are back in court today about, the FBI documents are heavily redacted. We will continue to review these as well as our legal options to seek the expeditious removal of these superfluous redactions. We will continue to seek the truth—including access to all relevant documents—as we pursue these matters in our respective lawsuits against the two agencies. You can view the DOJ documents here and the new FBI documents here. We have also updated our full timeline breakdown of these documents—providing you a minute-by-minute analysis of the DOJ and FBI emails—here.